My role : interaction and UI design : redesigning myGeonaute.com service : new graphics, new functions, making it responsive so that you can access it from every kind of devices. Description : mygeonaute.com is a plateform dedicated to sportmens where you can review and analyse all your sport workouts. You can either upload workouts you measured with one of the many compatible connected devices or the APP but you can also enter manually workouts on the site. myGeonaute contains a lot useful and fun functions such as visualizing all the details of your workouts and navigating easily through them ; knowing if you do enough exercise to stay healthy ; accessing statistics thanks to interactuve infography ; measuring your progress and comparing your workouts ; competing with your friends and so on. Strengths of the service : many compatible products (GPS watches, APP, coaching mp3 player, connected pedometer...), import and export easily your data, truly responsive site tested and apporved by users. 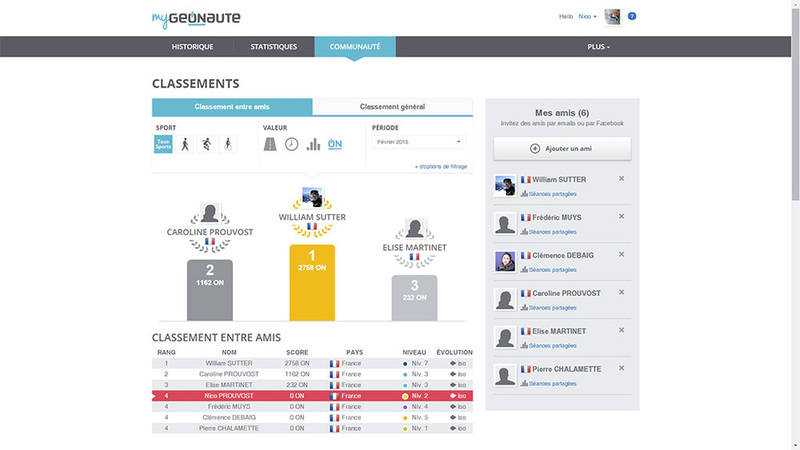 myGeonaute.com was finalist of the Oxylane Innovation Awards 2013 and won a design Award at Futurs En Seine 2014 in Paris.